The Peoples Democratic Party (PDP) has described the address made by President Muhammadu Buhari on the occasion of the Nigerian’s 57th Independence anniversary as a long speech of empty accusations. 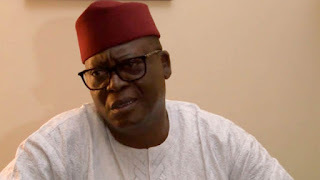 In a statement signed by its National Publicity Secretary, Dayo Adeyeye, the PDP said though it never expected anything fantastic from the President, the level of emptiness portrayed in the nationwide address was too grave to be ignored. It said President Buhari’s attempt to hoodwink Nigerians through the October 1 address did not succeed, as the speech, tailored towards deceiving the populace, could not do the magic he had hoped for. The statement reads: “Like every other right thinking Nigerians, the Peoples Democratic Party (PDP), watched with utter shock and disbelief, the Address made by President Muhammadu Buhari to Nigerians on October 1st, on the Occasion of Nigeria’s 57th Independence Anniversary. “We feel ashamed on behalf of the APC Government which promised much but almost three years into its tenure, has no meaningful development to show to the people except mere continuous deceit, blame game and display of lack of vision in actualization of its bogus campaign promises for good governance. “We wonder how President Buhari can, after two and half years of being on the Saddle still maintains the stale rhyme of meeting an empty treasury after all the hard evidence of huge funds left behind by the PDP led-Administration of Dr. Goodluck Jonathan Administration? “Another remarkable falsehood that caught our attention from the President’s uninspiring speech is the super-imposed narratives of how successful the APC Administration has handled the Issue of Insecurity in the Country especially, in the North-East Zone. “While the Government rejoice in self delusion, we make bold to say that since this government took over government more than two years ago, it’s all motion with no appreciable movement. “While the Government of the Peoples Democratic Party (PDP) was able to curtail the terrorists and ensured elections were peacefully held in the Troubled Zone without anyone getting killed during the Elections of 2015 by terrorists, we observe that the Situation in the North-East has worsened in the last two and half years. A complete counter of the promise made by the APC Government to effectively rout the Remnants of the Terrorists within two months of assuming office. “As far as we are concerned, the Only Achievement of the APC Government regarding the issue of the Boko Haram Insurgents, is the inability of government to protect Internally Displaced Persons (IDPs) who are being bombed at will by insurgents. “Given the Comments of President Buhari, we believe that he is either unaware, or just playing the ostrich with the daily bombings and ambushing of men of the Nigeria military formations by the Terrorists Group. “We say unequivocally, that insecurity has risen under this administration, as more cases of kidnapping, armed robbery, agitation for secession and general insecurity in the Country have escalated. “We also wish to let the President know that Nigerians are still waiting to see how his so called anti-corruption war will consume, through proper prosecution, his beloved suspended Secretary to the Government of the Federation (SGF), Babachir Lawal. Months after, the Panel Report is yet to be opened or treated, but the President had the temerity to tell Nigerians that he’s fighting corruption. “We are appalled that the Government gave itself pass mark on how it has handled the Nation’s Economy, and we wonder what the APC Government have done that has brought any positive impact on the Economy. “Under the watch of this administration, Nigeria’s economy, the Largest in Africa, drowned in the waters of Recession nay, depression due largely to the Government’s cluelessness, ineptitude and insensitivity in policy articulation and management of the Economy. “Nigerians will recall that the PDP handed over the Largest Growing Economy in Africa to the APC in 2015 but in less than one year, the visionless Party, mismanaged the Economy and the Result we are witnessing today is starvation, poverty, untimely deaths, unemployment and loss of jobs in millions. “Like every other Nigerians, we laughed when we heard the President spoke about the increase in power generation, but we simply wish to draw the attention of the President to the donation made by Governor Akinwumi Ambode to the Nigerian Police a few days ago. If the President is not aware, the Gift was a lot of Generating Sets. Generator in an economy where power generation is this high according to the President? We leave the rest to the people to judge. “Lastly, we wish to let Mr. President know that his speech did not achieve the Desired Goal. Nigerians are not impressed, except those who have been infected with the delusional virus of Buharism. “We state in clear terms that infrastructure are decaying at a fast rate under this administration, lives are being lost, jobs are being lost, Nigerians are being unnecessarily divided along ethnic and religious lines.